Woodside is great for many things including Filipino food, our favorite Thai Place Sripraphai, and lots of great Irish pubs! But something you don’t expect? A little bit of Paris so close to the 7 train! 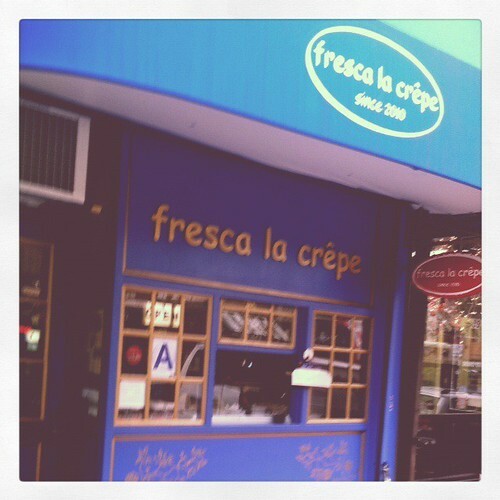 A quick walk from the Woodside-61st St. stop off the 7 (or if you take the LIRR to Woodside), fresca la crepe is a tiny blue storefront. There’s a little window in the front so that you can order outside when the weather is warm. You can also head into the tiny space and grab a seat at the counter or the table in the back. There are a handful of savory and sweet crepes as well as coffee/tea/espresso. Our favorite? The S'mores crepe – so good with dark chocolate! fresca la crepe 39-82 61st St. Woodside, NY 11377 Cash only!